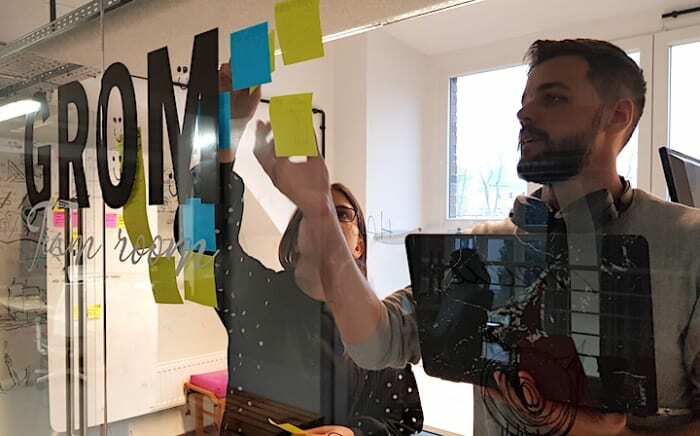 At Boldare, we deliver high quality digital product development through a combination of the lean startup approach and the agile scrum framework. The foundation of our process is a rigorous product discovery exercise at the beginning of every project, resulting in a clear (and agreed) product vision to keep the project on track. Let’s be clear, our approach is based on experience not theory. We look to use the specific techniques best-suited to the individual project and client. What our long experience has taught us is that when we start a digital product development project, we don’t want to talk about the product. We want to talk about the product vision. Why is that? Because enjoyable as the creation phase is, first we need to fully understand what we are creating, and why. Only then can we agree on a product development strategy and then begin the work on the product itself. Business Model Canvas – this template is used to gather details of the needs and goals of the client’s business, the company’s value proposition, its infrastructure and finances, its customers; this tool gives us the bigger picture in detail, going beyond the context of the product. Product Canvas – this canvas ensures that the development process address the key questions in relation to your product: the target users, its purpose, its goals, the metrics that will measure success. One of our key kick-off activities on any project is to compare these two canvases, ensure they are aligned, and explore further any discrepancies or contradictions between the two. System Story – this is a deceptively simple-sounding exercise: create just one sentence to describe the product being built; it’s all the relevant information condensed to a single focus and provides an answer to any questions or doubts during the project - when a developer, designer or analyst is faced with options or choices, the system story indicates the appropriate direction. Pre-workshop questionnaire – prior to the Product Vision workshop, we ask client to complete a pre-workshop questionnaire; this gives us much of the essential information beforehand and allows to quickly focus on the sticking points and key issues. 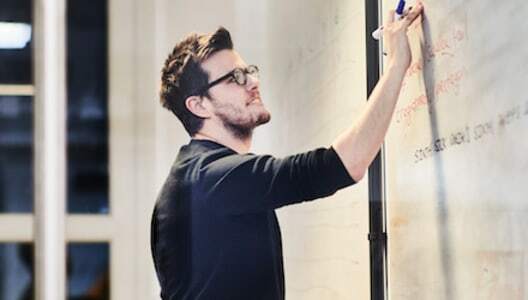 Product Vision Board – ultimately, all the details are summarized using a product vision board, including the vision itself, the target users, the need or problem that the product will solve, and link to the client’s business goals. The product vision is the overarching goal you are aiming for, the reason for creating the product. It provides a continued purpose in an ever-changing world, acts as the product’s true north, provides motivation when the going gets tough, and facilitates effective collaboration. The product vision is a set of data or information. That information relates to the product, its target users, and the project goals. It is not a list of product features for the development team to implement. At this early stage, it’s all about the problem or need instead of what kind of solution will be built. Not only does the product vision kick-start the project by exploring and validating the concept behind the product, it also builds a shared understanding that can be invaluable in keeping the project on track. And a two to three-day facilitated Product Vision Workshop with the client is the event on which this activity centers. Produce a vision and strategy which translates into the development of a product vision board plus system story. Establish a decision structure for the project. Ensure the Product Owner (client representative) has a clear vision of the project agreed with stakeholders. Project and development roles and responsibilities are agreed. Before the workshop takes place, we ask the client to complete a pre-workshop questionnaire. This document contains 22 essential questions, diving deeply into five key topic areas: target users, competitors, weaknesses (including the client business, the desired product, and the target users), values, and image. 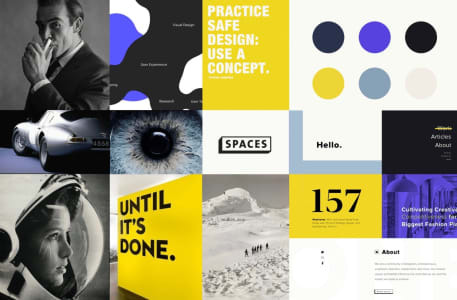 Once we have a completed questionnaire, we prepare for the workshop by looking for any areas that are incomplete or contradictory and then we spend the workshop time more productively by tackling the misunderstandings, the non-aligned elements, and any lack of clarity, using tools such as Pichler’s Product Vision Board. Who exactly is it addressed to? And… a tricky one: what for? Let’s be clear, the system story is not easy to write. It’s intended to act as a summary of the information from the workshop and as the project compass, and as you might expect, creating a one-sentence version of everything so far usually takes a while. However, once you have it, that single, perfectly descriptive sentence is the gateway through which the whole project must pass. Or to put it another way, it’s a traffic light – whatever ideas or features or strategies arise for discussion as the project progresses, there’s just one question: Does it further the system story? If the answer is yes, then it’s a green light, go ahead. If it’s a no, then red light. the product vision workshop is also the most efficient and time- and resource-effective method of starting a project we’ve found so far. 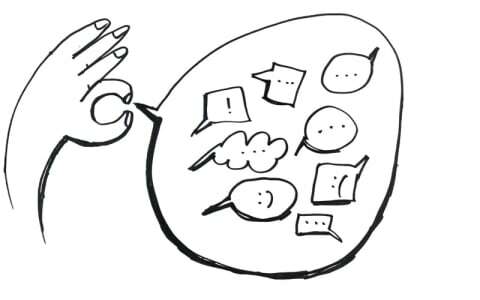 It’s an essential opportunity for the client and the whole product development team to meet and talk, setting the standard for communication for the whole process (hint: openness, clarity, questions and two-way feedback are what we’re aiming for every time). Bringing the key players together on a highly focused task builds trust, and motivates and inspires the team. We often say that at Boldare we like to join the client’s team rather than act as traditional outsourcing providers, and the Product Vision Workshop is key to achieving that. 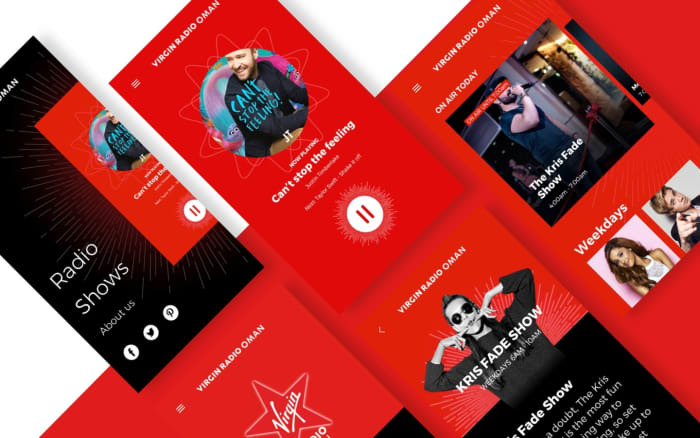 To support a new youth-oriented radio station in Oman, SABCO Media had just four weeks for the development of mobile apps and a web app for the Virgin Radio brand. This was an interesting challenge in which the product vision had to take account of the needs of a strong global brand with a well-known visual identity, while reaching out to a specific demographic (Generation Z) and culture. The Boldare team included two designers, three frontend developers, one iOS developer, one Android developer and a Scrum Master. The whole team was at the Product Vision Workshop, along with the client’s Product Owner and other key stakeholders. Firstly, the workshop highlighted the existence of a number of product goals. To keep the project focused (and with the short timescale in mind) a single goal was agreed: To introduce young, hip music lovers to a completely new disruptive and innovative place they can call their own. For the metrics, there was no legacy data to draw on (Virgin Radio Oman was offering a completely new teenage music experience in Oman) so the number one key metric was, “convert users into active and returning radio listeners”. The most important outputs were the system story - “Web and mobile platforms providing the listeners with a disruptive and innovative place they can call their own; for teenage music lovers who lack other alternatives.” - and a series of user stories which gave insight into the product scope and informed the specific tasks that would contribute to achieving the project goals. The result was that MVPs of the two mobile apps and the web app were launched within a very tight deadline and SABCO is now looking ahead to the next phase of product development, with Boldare as partner. The Product Vision Workshop is the essential start to a digital product development project. By gathering all the key players into one place, the core project information can be discussed and agreed, including goals, scope and responsibilities. The results then become an invaluable way of keeping the project team focused and aligned with the client’s business needs.